Catherine Conover, the first wife of Virginia Senator John Warner and daughter of the late Paul Mellon, has reportedly transferred title of her property at 3200 S Street, N.W. to 3200 S Street Corporation for $2,917,000. The Georgetown home where Conover and Warner raised their three children is located just across the street from the house Warner later shared with his second wife, actress Elizabeth Taylor. The Mellon heiress, who prefers to use her mother's maiden name, is the founder of Island Press, a small D.C.-based environmental book publisher. She is also a director of the Center for Resource Economics and one of the largest donors to Pike's Tides, efforts which pay homage to her father's own environmental concerns, including the creation of Cape Hatteras as a national seashore and his donation of Sky Meadows State Park to the Commonwealth of Virginia. Writer Elizabeth Drew has sold the home she shared with her late husband, David Webster, at 3000 Woodland Drive, N.W in Massachusetts Avenue Heights. A journalist and author, Drew has been one of the nation's most prolific political observers. She began her career writing with the Congressional Quarterly, then wrote for Atlantic Monthly before going on to a 20-year career at The New Yorker as a Washington correspondent. Throughout her 40 years in the nation's capital she has written more than ten books on such topics as Watergate, the Clinton Presidency, and the Gingrich Congress. Her late husband was a senior BBC official who was a producer of the current affairs program “Panorama,” and was later named director of public affairs with a seat on the BBC's board of management. Now remarried to David Felton, a computer consultant, Drew sold her old home for $2 million to Michelle and Patrick Bryski after just two weeks on the market. Patrick Bryski is managing director of BearingPoint, the former KPMG, one of the world's largest consulting firms. In Dupont Circle, 1408 Hopkins Street, N.W. has been sold for $1,410,000. The five-bedroom Tuscan-style rowhouse which sits on a quiet lane off P Street, N.W. was built in the early 1900's. Its Mediterranean inspired façade is adorned with an Adam doorway flanked by slender Ionic columns which perfectly balance a second story balcony. The building's architecturally stunning interior was renovated by designer Lisa Vandenberg. The home had belonged to Dr. Lloyd I. Sederer who for the last two years served as director of clinical services at the American Psychiatric Association. He has now moved to New York where he is that city's first executive deputy commissioner for mental hygiene in the newly created Department of Health and Mental Hygiene. His former abode now belongs to Michael A. Grow, a partner with Arent Fox Kintner Plotkin & Kahn, and his wife Leslie. 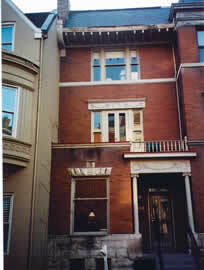 The Kalorama penthouse Unit 42 in The Chancellery at 2141 Wyoming Avenue, N.W. has sold. 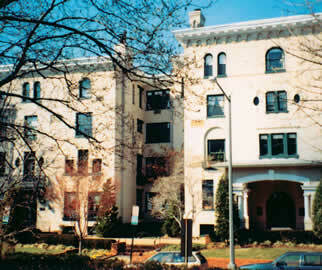 Built in 1912, The Chancellery is one of Washington's most architecturally renowned apartment buildings and this penthouse's unique floor plan is detailed in James M. Goode's, “Best Addresses: A Century of Washington's Distinguished Apartment Houses.” The apartment 's southwest exposure and charming balcony afford lovely views of Kalorama, which itself is Greek for “good view.” The seller, Sarah Ball Teslik, was the first executive director of the Council of Institutional Investors, a position she held for twenty years prior to her resignation last September. She is now chief executive of the Certified Financial Planners Board of Standards, Inc. in Colorado. She bought the 2,117 square-foot, two-bedroom elaborately appointed penthouse in the summer of 2003 for $1,120,000. She has now received $1,295,000 for the property from Liz Lichner who is believed to be a World Bank official. In Potomac, James Warner has sold 9909 Avenel Farm Drive to Sujin Hur and her husband Dr. Dongzin Hur, a pain specialist, board certified in anesthesia. Washington Life last reported the home's sale in December 1999 when the price tag for the Bell-built custom home was $2 million. Six years later, the decade-old house which sits on two acres punctuated by a pool, has sold for $2.9 million. Edward Leisher, vice president of Potomac Insurance Marketing Group, has sold his Montgomery County residence at 10104 South Glen Road. The purchasers are Jennifer and Todd Malamut. Mr. Malamut is a licensed broker and senior vice president of National Real Estate Brokerage, Inc. located in Rockville. The price tag on his new residence was $1.15 million. Also in Potomac, 11309 Hidden Hollow Court has changed hands. The three-bedroom home had belonged to Bonnie D. H. and Alan Hammerschlag, who in 1994 cofounded Kodiak Properties LLC to purchase strip malls for investment purposes. The company's current portfolio contains properties in Virginia, D.C., Maryland and Pennsylvania. The couple has been ardent supporters of mental health research and last year they co-chaired D.C.'s first fund-raising gala for NARSAD, the leading private sector organization exclusively devoted to supporting research on mental illness. The Hammerschlags received $1.28 million for their Montgomery County property from new owners Nikol T. and Diego P. Paez. Located in the gated community known as The Reserve, 892 Alvermar Ridge Drive in McLean has sold. The five-bedroom fieldstone house with five and two half baths was built in 2002 by M. B. Visnic Homebuilders and the asking price for the property was $2.95 million. The home's grand entrance foyer features hickory flooring, recessed lighting, crown moldings and French doors leading to a wraparound porch. 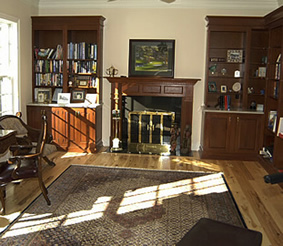 The foyer's upper gallery boasts built-in display shelves and a window seat. The living room also has hickory floors, a French pocket door and plantation shutters which add to the room's old world charm. The chef's kitchen is further enhanced by an adjacent breakfast room with a floor-toceiling fireplace and access to a garden. The master bedroom suite is appointed with custom-designed built-in dressers and floor-to-ceiling shelves. A separate dressing room contains a vanity and hisand- hers walk-in closets. Three additional bedroom suites complete this level. There is also an au pair suite with its own full bath on the home's lower level. Additionally, this floor houses a large entertainment room, a media room with yet another grand fireplace, and a mirrored fitness room. This level also hosts an indoor driving range. The sellers are Elizabeth and Brian McVay, who is senior managing director with the global commercial real estate company, Cushman Wakefield. The buyers are businessman James Stone and his wife, Megan. Michael and Susan Larson recently paid $3 million for the Langley Forest property, 6722 Benjamin Street in McLean. Susan Larson is believed to be affiliated with the Johns Hopkins University Bloomberg School of Public Health which explores ways to develop vaccines using genetically modified adenoviruses. Michael Larson is a controller and CFO for Johns Hopkins University. The seller of the five-bedroom home with five and three half baths is Michael Pusateri, a Weichert realtor.